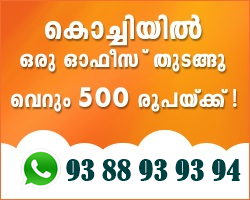 You can open a virtual office in Kerala's commercial capital Kochi paying just Rs.500 a month. "With the intention of providing affordable office space solution for freelancers, start-ups, home-based businesses, NRIs and student entrepreneurs to show their business presence here, we came up with this idea. We offer service at affordable cost without compromising the quality," said Boby Thomas, founder and chief executive of the company which launched this cost-effective service here Tuesday. "Our service gives a virtual platform for businesses to operate remotely and still show their presence in the city. We have plans starting from as low as Rs.500 per month," added Thomas. Spacelance.com will provide a prestigious address at the heart of Kochi, a dedicated virtual landline number with a Kochi STD code, a virtual Kochi fax number, a live receptionist to answer and forward your customer calls and mail handling and office support facilities. Any interested person can choose a virtual phone number from a pool of available numbers and have the option to forward it to the personal phone number or to a voicemail. The service also allows setting up a customized greeting for virtual number with your company name before redirecting the call to you. Basic plan starts at just Rs.500 a month, which includes a virtual address and mail handling services. The standard plan is Rs.1,000 per month which gives an additional dedicated virtual phone and fax number. The ultimate plan, priced at Rs.1,500 per month, gives everything in basic and standard plans along with a live receptionist and office support facilities. Also get Firm's Virtual Office Registration Certificate. The company is offering a one week, free trial for all plans. According to a report in November 2012, over 27,000 businesses use virtual offices in India and the requirement is estimated to increase at a rapid pace of up to 300 percent every year. Spacelance is currently focusing on providing the service in Kochi but has plans to expand its services other cities in the country. Virtual offices are popular in countries like the US and Britain.